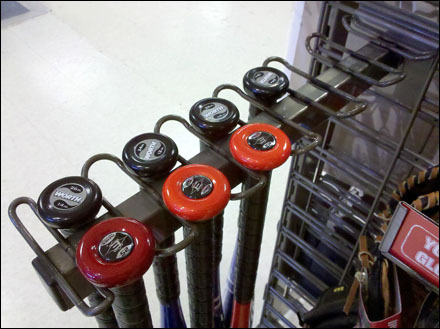 Black gondola, black Slatwire, black Hook fixtures … this store’s branding goes well beyond middle-of-the-road retailing with this Double-Sided Baseball Bat Holder for Slatwire. And both black and red bats look quite professional in this Slatwire Baseball Bat Holder environment. 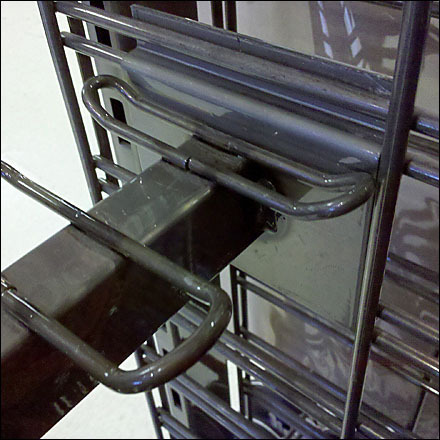 CLICK the thumbnail for Double-Sided Baseball Bat Holder for Slatwire fixture construction details. Backplates of this design also mount to Slatwall.